Congratulations to the 2009 HIO Award Recipients! 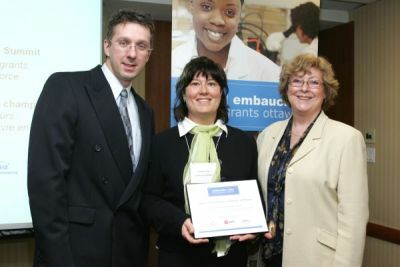 The University of Ottawa and Human Resources and Skills Development Canada (HRSDC) received 2009 Employer Excellence Awards for outstanding practices in recruitment of skilled immigrants. University of Ottawa was recognized for its Access uOttawa program. The purpose of Access uOttawa is to recruit a pool of fully qualified and job-ready bilingual candidates, including skilled immigrants, to promote diversity at the University. The program supports managers in filling short term positions and provides valuable, marketable work experience to candidates in all targeted groups. Human Resources and Skills Development Canada (HRSDC) supports Canadians in meeting the challenges they face by putting in place policies, programs and services that are flexible, that create opportunities in today’s labour market and that provide choice. Its Immigrant Internship Pilot Program (IIPP) highlights their commitment in outstanding practices in the recruitment of skilled immigrants. Certificates of recognition went to Association pour l’intégration sociale d’Ottawa and Citizen Advocacy Ottawa for their promising practices in recruitment and retention of skilled immigrants. L’ Association pour l’intégration sociale d’Ottawa was recognized for adapting its human resources management practices to recruit a diversified workforce. Thanks to its productive partnership with La Cité Collégiale, the association has been able to hire well-trained immigrants who make an exemplary contribution to its mission. 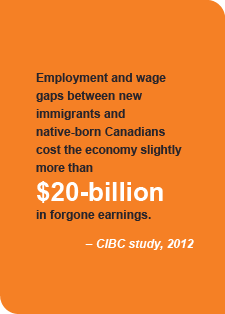 Immigrants have transformed the association, making it an employer of choice in a prized work environment. Citizen Advocacy of Ottawa was recognized for its employee retention within its Everyday Champions program. 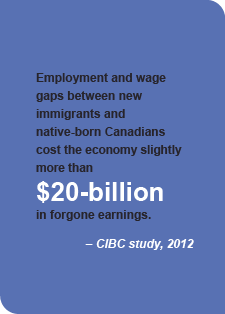 By providing extra support to new immigrants in the workplace so that they can adjust to language differences and to a different cultural context, Citizen Advocacy of Ottawa shows how they are adapting to the face of an evolving labour force. Recently hired internationally trained social workers, in particular, benefit from the organization’s senior social workers’ mentorship and support to new employees.